Charcoal zip-up hoodie featuring white stars and bars artwork on front with weathered zipper print. 50% cotton/50% polyester. This hoodie is awesome! Comfy warm and looks great! Just like the previous 4+ orders we have made here everything is amazing! We will definitely order more from them in the future. I bought this hoodie several years ago and it is still in good condition. I ordered another one for my boyfriend last year cause he wore mine all the time. 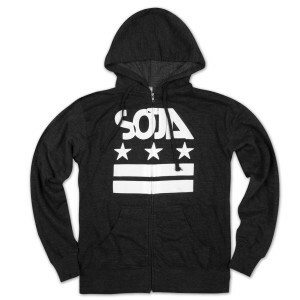 Gonna order one more for me cause its so cozy. They are always sold out at the concerts so I'm glad I'm able to get them online. Pretty true to size. Looking forward to a new style of hoodie too! !